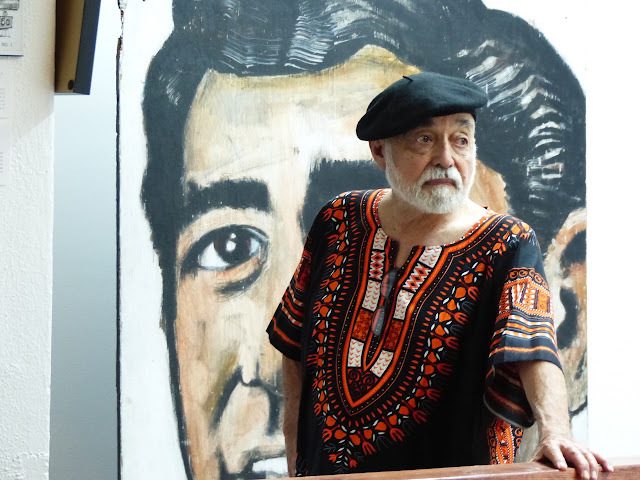 Con Safos co-founder and original Editor-in-Chief Arturo Flores in front of a 1970 Ruben Salazar portrait by Sergio Hernández. Photo by Oscar Castillo. The passage of nearly 50 years has not dimmed the radical glint in their eyes. On July 9, the founders of the legendary Chicano publication Con Safos: Reflections of Life in the Barrio, reunited for an evening of war stories, snacks and a playfully nostalgic revival of the once annual Tortilla de Oro Awards presentation at the Museum of Social Justice in downtown Los Angeles' historic Placita Olvera. From February through August of this year, the museum housed memorabilia, art and artifacts as a survey of some of the issues and satirical artwork that made Con Safos an incendiary publication during the turbulent tail end of the1960s. Satirical cartoons, anti-war spreads and photos by renowned photographer Oscar Castillo, among others, graced the museum’s walls. Also included was a spread covering the death of Los Angeles Times journalist Ruben Salazar, who was killed during the 1970 National Chicano Moratorium march against the Vietnam War. “We managed to offend nearly everyone,” said former Con Safos editor-in-chief Arturo Flores, decked in a black beret as he welcomed guests and reflected on the publication’s grassroots power. “There was nothing that was barrio focused at the time,” explained Flores, recalling how he and fellow Cal State students decided in 1959 that it was up to them to establish a publication that would speak in the voice of Chicanos. It was in 1968 that the project truly came to fruition as the streets—if not the world—boiled. “Funding came out of our own pocket,” recalled Flores. The publication would reach far and wide, even beyond its East L.A. birthplace, with its eclectic blend of satire, socio-political essays and barrio humor. Sporting dark shades, Rudy Salinas, who, as a Con Safos co-founder, handled the socio-political side of the publication, remembered a staff that was getting involved in the major battles of the day even as they prepped new issues of the widely circulated periodical. Salinas remembered the pre-computer days, when putting together an edition involved much cutting and pasting, “It wasn’t simply pressing buttons. It was hard. We were not professional magazine writers. Ok, we had an idea, but there was a lot of laughing, quemadas, because we knew each other. Four of us went to the same high school,” recalled Salinas. “We would say we’ll get together and work on the magazine at 6 p.m, but then we would start telling stories, the chismes and the quemadas would take over, and we would get to work on the magazine at 11 p.m. Plus there was always someone drinking or smoking pot.” Salinas shared a running joke from the time for subscribers: Con Safos would guarantee four issues a year, but there was no guarantee on when you would actually get them. “Boy there were some wild times,” acknowledged Flores, remembering the hassles and trials of editing. “One guy attacked me over a comma, over this one comma I took out of his article.” If producing a Con Safos issue turned, on occasion, into a party, the content itself was important enough for the FBI to take notice. At one point, as Vietnam War protests and Chicano activism exploded, agents raided the Con Safos offices and confiscated the layout galleys for an entire issue that were never returned. After friends and fans helped themselves to an array of cookies, cheeses, salad and chips with nacho dip, attendees were treated to a 20-minute clip from an upcoming documentary about Con Safos. Ten years in the making, the film features individual Con Safos staff as they share their stories and memories. They reflect on the ‘60s and the Chicano movement within the broader context of the anti-war and Black Power movements of the times. During a short discussion following the preview, the magazine’s founders answered questions and shared more memories. Founding staffer Antonio Gómez revealed how their publication was so independent it even managed to offend other, established Chicano entities like M.E.Ch.A and the Brown Berets. “At one point there was an attempt to take over Con Safos,” Gómez said, adding that Eastside militant radicals with guns once approached the magazine’s offices and tried to stage a coup. As he explained it, when hierarchies began forming even within activist circles, a mischievous and satirical voice like Con Safos rattled many feathers. After the Q&A, Flores began giving out the Tortilla de Oro award to various supporters and friends of Con Safos who have kept the publication’s spirit alive. Brooklyn & Boyle editor and publisher Abel Salas was awarded one of the golden tortillas in absentia for his diligent work and friendship. This humble staffer accepted the award in Salas’s place and managed to spout a quote by the German satirist Kurt Tucholsky. Jessica Hough, Director of Exhibitions for the California Historical Society, was present for the ceremony and reflected on Con Safos’s value as a document of an era. “I’m sure they didn’t think of it as a document at the time, they saw it as a political and creative endeavor,” said Hough. While such a Con Safos comeback issue lingers as a promising, if elusive, possibility, a new book tracing the development of Con Safos and examining its critical role as a forum for ideas and expression is a worthy consolation. Nearly 400-pages long, Voices from the Barrio: “Con Safos: Reflections if Life in the Barrio” by Maxine Borowsky features contributions and from former editorial staff, selected reprints of prose, poetry and fiction as well as illustrations that ran in Con Safos (1968 - 1972). The book and the exhibit, which ran through August, make for a powerful, complimentary study certain to trigger further interest in Con Safos, which published early work by many now famous writers and artists, among them Oscar Zeta Acosta and Gilbert “Magú” Lújan. Voices of the Barrio is available on Amazon and local booksellers near you.